It started raining around 10 pm and didn’t stop. It was like a crescendo, moments of hard rain transitioning to softer rain, then pausing before a gust of wind brought another bought of heavy rain. This repeated all night. We were cozy in our tent. No puddles this time. Just cold air. When our alarm went off at 5 we bargained with Speed to leave at 6:30 rather than 6. 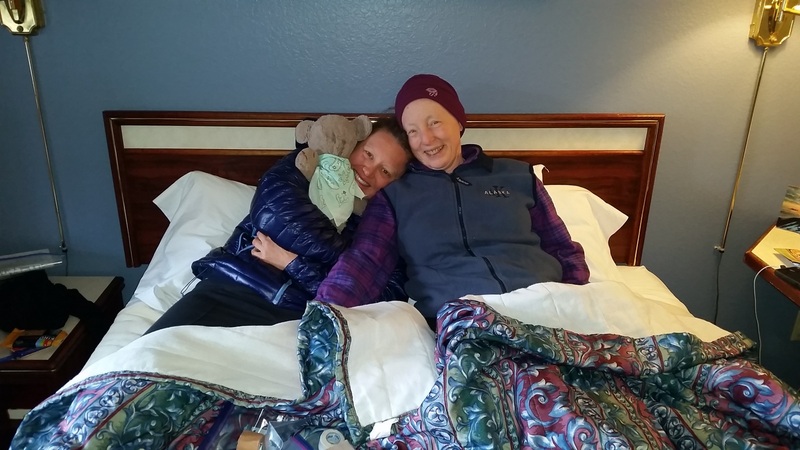 It was only 8.8 miles to the highway and Nana (Laurie’s godmother whose name is Joanna). We had asked her to meet us around 10 am. It was more appealing to walk fast to make up time rather than wait around in the cold. We left camp at 6:30 exactly. As we walked it started to rain, then sleeted then snowed. Our hands and toes were aching from the cold. Laurie led the charge, walking fast in an attempt to get warm. We didn’t talk much, all of us uncomfortable and wishing the sun would come out. “I am just so excited” chimed in Laurie as she slowed down. 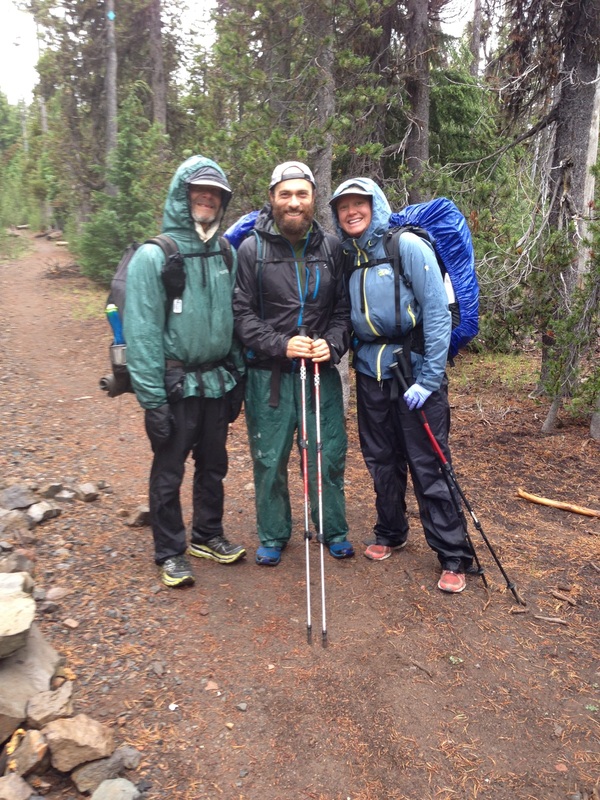 We walked at a comfortable 2 miles per hour embracing the rain and sleet and smell of wet earth. The ground was soft and the walking easy. Although, everything feels easy when you know you have a shower and homemade pie in your near future. From 100 meters away from the trailhead Laurie spotted Joanna. She waved and Joanna waved back. “Nana!” Exclaimed Laurie as she attempted to run down the trail, as much as anyone can run after walking 540 miles without a day off. 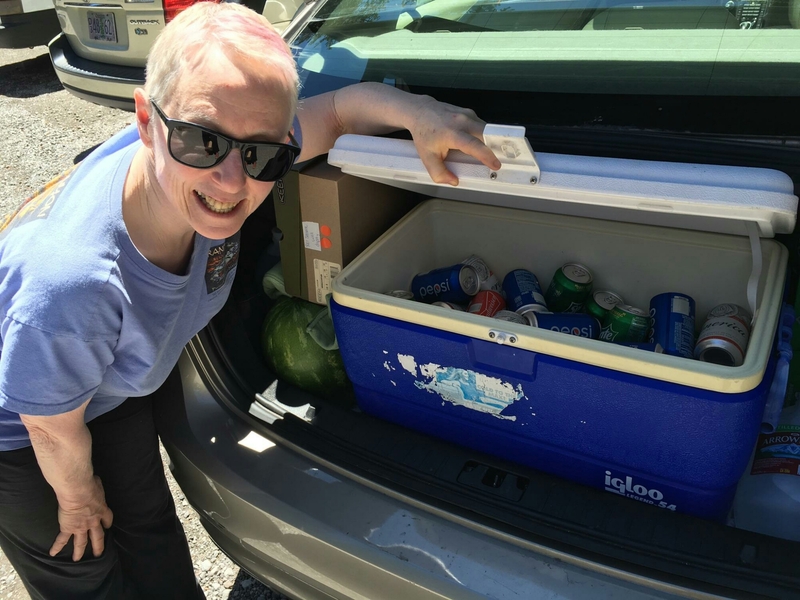 We all hugged and Joanna went into trail angel mode – offering watermelon, soda, beer, chips and brownies. Unfortunately with the cold, all we wanted was a heated car. We ate potato chips as we reconfigured the car to fit 3 wet hikers plus Joanna and all the food. We made it work and drove to Mazama Village (the campground at Crater Lake) where we picked up our resupply boxes, said goodbye the Speed and left him with a bag of brownies. Given the rain and snow, we opted to postpone the sightseeing and drove to our motel in Prospect hoping they would have a room ready. Within 30 minutes we were in our room unpacking wet and stinky backpacks and clothes. 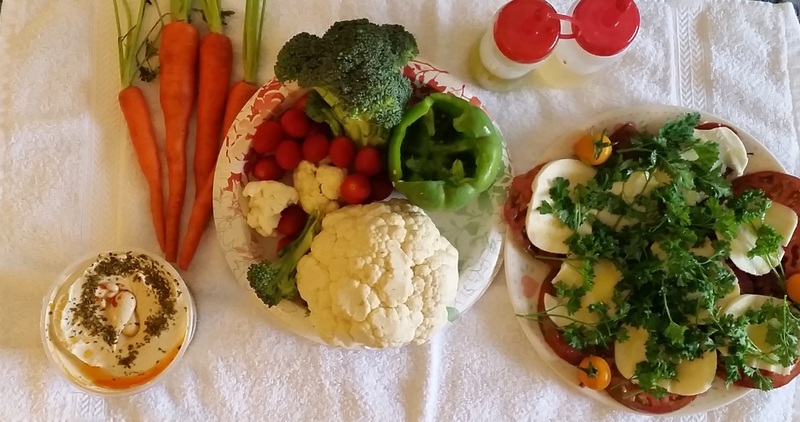 We showered and enjoyed a gourmet picnic on the bed – hummus, veggies, tomato and mozzarella with olive oil and PIE! 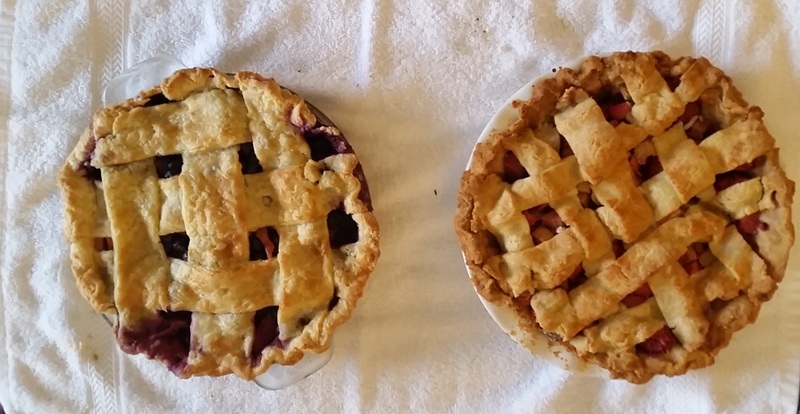 Joanna had made a gluten free strawberry rhubarb pie for Laurie and blackberry, blueberry and peach pie for Andy. We were in heaven! We hung our tent in the bathroom to dry while we made a field trip to the laundromat. Laundromats provide a lot of entertainment and allow passer through-ers (like us) the opportunity to get a sense of a town. The people who came and left the laundromat were friendly. They offered their opinion on the quality of the laundromat and gave advice on which washers and dryers to avoid. Unfortunately, each time the advice came too late. But it didn’t matter, we were happy to have some sembelence of clean clothes. The sun came out as we waited at the laundromat. Joanna took a nap in Laurie’s lap as we worked on our blog posts. We attempted to upload them but the wifi was too slow. We returned to our motel and tried again. Again, it wouldn’t work. We were both frustrated. This keeps happening. After the most recent WordPress update the uploads fails unless we have strong wifi; not even 4G will suffice. While attempting to upload we chatted with other people staying at the motel and B&B. One woman asked what has been the best unexpected aspect of the trip. 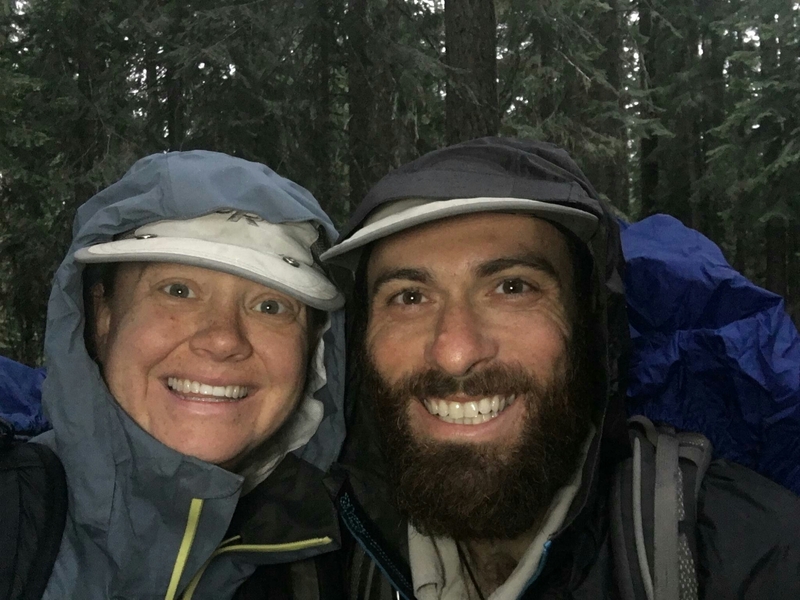 Our answers were similar; the Northern California sunrises, wildflowers and the joy of meeting other hikers and people in town. Around 7 pm we returned to our room and had dinner in bed. Andy has been talking about Thai curry for over 1000 miles and Joanna surprised him with red and green curry. It was delicious! Then we had pie for dessert. It was another feast. Laurie felt so full she thought her stomach would explode. So much fresh and delicious food – neither of us wanted to stop eating! We feel so deeply grateful for the support of our families. Thank you Joanna for all the yummy food! By 8 pm the rain had stopped. Laurie and Joanna took a short walk to a waterfall. Unfortunately the mosquitoes were out in full force so they didn’t stay out very long. Even towns can’t escape the July mosquito frenzy! It’s been a great day and we’re hoping the weather clears for tomorrow when we go to Crater Lake! Tonight we are grateful for visits from family and Joanna’s homemade pies. Wow taht pie sounds incredible! i think I need the recipe!!! 🙂 nothing like pie to say love!